, a Danish historian, is supposed to have been a native of Denmark, but this has been a disputed point. As to his name Sachse, it is evident from many monuments of Danish antiquity, that it is of no obscure or late origin in the history of Denmark. Saxo himself calls the Danes his countrymen, Denmark his country; | and speaking of the kings, he terms them our kings. Some attribute his origin to Ambria, others with more reason to Sialandia, a Danish island. 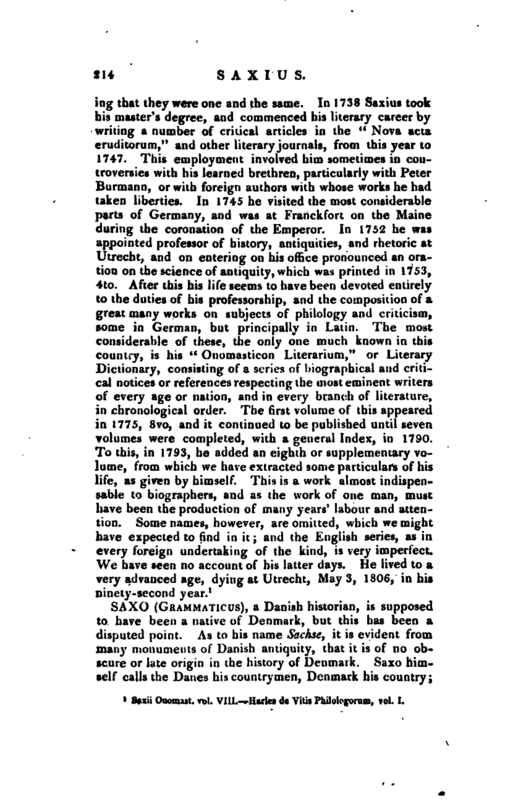 The name Scalandicus is also added to that of Saxo, in some editions of his works. He has been called Longus, which has induced some to attribute his descent to the noble family of the Langii. Others have rather chosen to ascribe this name to the height of his stature. Saxo, in his preface, speaks of his ancestors as having been distinguished in war, which indicates that they were of no ignoble race. 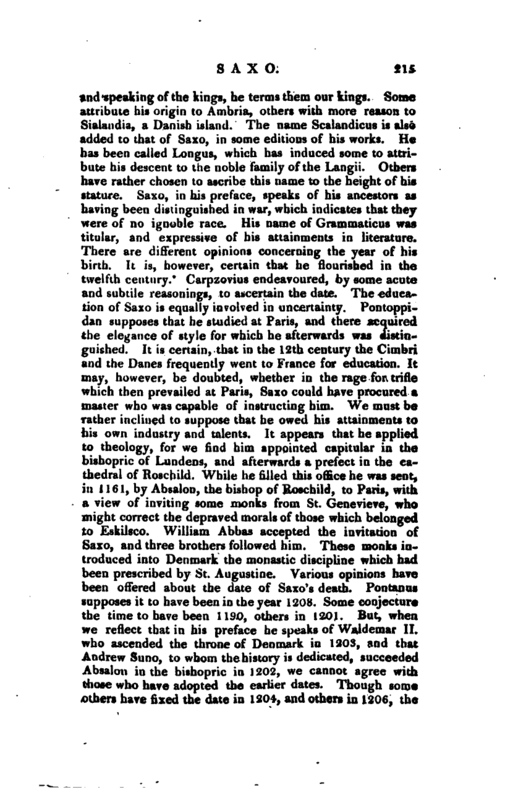 His name of Grammaticus was titular, and expressive of his attainments in literature. There are different opinions concerning the year of his birth. It is, however, certain that he flourished in the twelfth century. Carpzovius endeavoured, by some acute and subtile reasonings, to ascertain the date. The education of Saxo is equally involved in uncertainty. Pontoppidan supposes that he studied at Paris,and there acquired the eleg.ance of style for which he afterwards was distinguished. It is certain, that in the 12th century the Cimbri and the Danes frequently went to France for education. It may, however, be doubted, whether in the rage for trifle which then prevailed at Paris, Saxo could have procured a master who was capable of instructing him. We must be rather inclined to suppose that he owed his attainments to his own industry and talents. It appears that he applied to theology, for we find him appointed capitular in the bishopric of Lundens, and afterwards a prefect in the cathedral of Roschiid. While he 'filled this office he was sent, in 1161, by Absalon, the bishop of Roschiid, to Paris, with a view of inviting some monks from St. Genevieve, who might correct^the depraved morals of those which belonged to Eskilsco. William Abbas accepted the invitation of Saxo, and three brothers followed him. These monks introduced into Denmark the monastic discipline which had been prescribed by St. Augustine. Various opinions have been offered about the date of Saxo’s death. Pontanus supposes it to have been in the year 1208. Some conjecture the time to have been 1190, others in 1201. But, when we reflect that in his preface he speaks of Waldemar II. 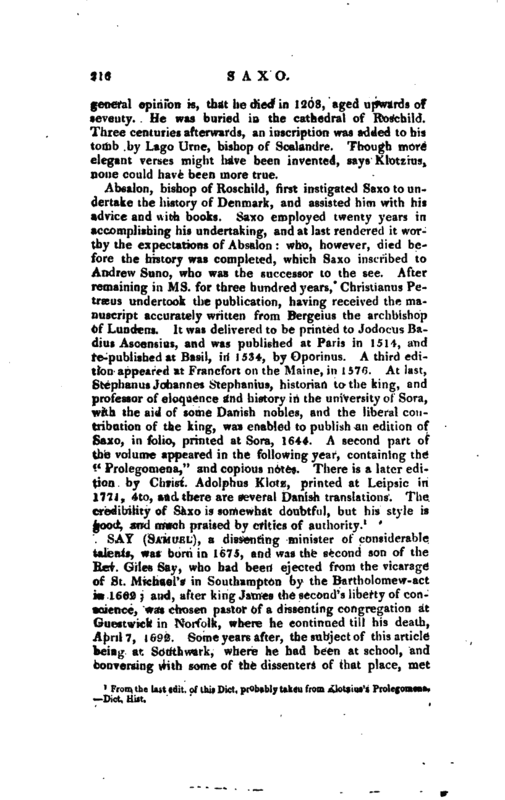 who ascended the throne of Denmark in 1203, and that Andrew Suno, to whom the history is dedicated, succeeded Absalon in the bishopric in 1202, we cannot agree with those who have adopted the earlier dates. Though some others have fixed the date in 1204, and others in 1206, the | general opinion is, that he died in 1208, aged upwards of seventy. He was buried in the cathedral of Roschild. Three centuries afterwards, an inscription was’ added to his tomb by Lago Urne, bishop of Scalandre. Though more elegant verses might have been invented, says Klotzius, none could have been more true. From the last edit, of this Dict. probably takeu from Klotaius’s Prolegomena. —Dict. Hist.